Submitted by Gina Asprocolas on Mon, 10/24/2016 - 11:54. NEW YORK – October 24, 2016 – Today’s teens have many ways to connect and share with their peers including online, social media, texting and more. Even though there are countless options available, teen artists and writers still search for an online “safe space” to share their creative processes with fellow peers. 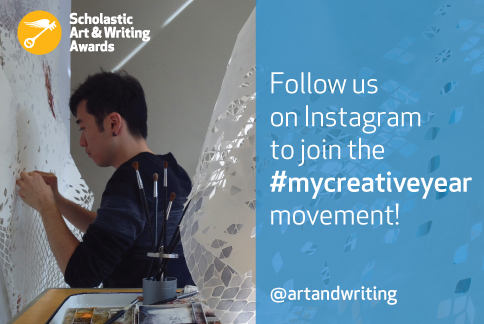 In support of the 2017 Scholastic Art & Writings Awards, the Alliance for Artists & Writers will host the #MyCreativeYear campaign encouraging teens to share their artistic journey on social media. The ultimate goal is to create a positive, collaborative platform for teen artists and writers to post videos, photos and stories about their inspirations, their process, where they create and how being an artist or writer influences their daily life. Starting today, teens are encouraged to upload videos and share their story become part of the #MyCreativeYear community. To learn more, follow @ArtandWriting on Instagram and visit artandwriting.org. It’s inspiring! Sometimes it’s the small things, like the color of the trees in a backyard, and sometimes it’s something bigger, like having friends around during a difficult time, that bring out the artists or writer in these teens. Seeing how these teens turn the small and big moments in their lives into something that can be shared and appreciated by others is inspiring and worth watching. It’s captivating! From “mind maps” to tracing images onto cloth, creative teens have come up with hundreds of new ways to explore the creative process. For some students, waking up in the middle of the night to write gets their creative juices flowing, for others, a little bit of drawing here and a little bit there helps them finish a new work. Everyone’s process is different, and watching students discuss their particular creative process can be fascinating. It’s eye-opening! When most people see a painting in a museum, or read a classic book of literature, they might assume that there’s no way anything they create will be half as good. But what they don’t know is the finished work is only a small part of the creative journey. #MyCreativeYear goes behind-the-scenes to show all the second-guessing, crossed out lines, and tossed out drafts that go into creating that final masterpiece. It’s your voice. #MyCreativeYear teens are next-door neighbors, students who sit in the back of the class, and students in the front row. They’re in the drama club, on the football team or starting over in a new school. They’re regular kids, making art and writing, and putting it out there in the world. Follow #MyCreativeYear to see yourself, your friends and what you all can accomplish if you give creating a try. Following #MyCreativeYear doesn’t end with watching the videos—teens should grab a pen or a paintbrush, a laptop or some clay and join in the fun. To share their story, teens can film their process, upload at artandwriting.org/mycreativeyear, as well as tag their video on social media using #MyCreativeYear.